Kwei Quartey was born in Ghana and raised by a black American mother and a Ghanaian father. A practicing physician, he lives and works in Pasadena. He is the author of four other critically acclaimed novels in the Darko Dawson series, Wife of the Gods, Children of the Street, Murder at Cape Three Points, and Gold of Our Fathers. Find him on Twitter @doublekwei and on his website, kweiquartey.com. "Vastly engaging . . . Apart from the thrill of the detecting, Death By His Grace offers an education in Ghana’s history, social life, eating habits and other customs peculiar to that endlessly intriguing country." "There’s plenty of delicious Ghanaian food mentions to salivate over and a friendly overview of Accra’s plentiful neighborhoods, but Quartey covers the bad as well as the good: an inherent part of the plot here includes the workings—and cons—of a charismatic church and its self-enriching leader." "Quartey’s Ghanaian mysteries, driven by tension between traditional culture and modernity, share top-notch writing and full-sensory settings with those of Michael Stanley, Deon Meyer, and Parker Bilal." 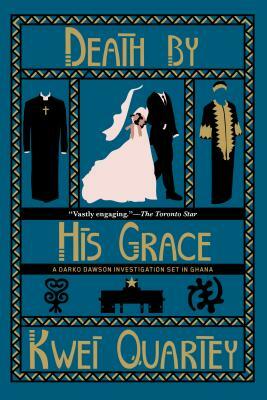 "This is a delightful novel, rich in Ghanian culture, with a hero we really come to admire." "An absolute gem of a first novel and the sort of book that will delight not only hard-core mystery fans, but also those who visit the genre only casually in search of an occasional literary entertainment . . . Wife of the Gods undoubtedly will be compared with Alexander McCall Smith's phenomenally successful No. 1 Ladies' Detective Agency series, but Quartey's debut is—to this reader, at least—a far richer and more sophisticated experience." “[Quartey] renders a compelling cast of characters inhabiting a world precariously perched between old and new . . . Intriguing." "Quartey’s mastery of the art of misdirection serves him well . . . A complex plot, combined with a warts-and-all lead and an evocative portrayal of the author’s native country, add up to a winner."